My new year’s resolution was not to buy any wargaming stuff until I had sold some – an attempt to keep some sort of balance in what I have and reduce my groaning stock of unpainted lead and, more recently, plastic. So I have some sales to show you and if they don’t sell via readers of this blog then they will go onto eBay in about a week’s time. Call it a sneak preview. 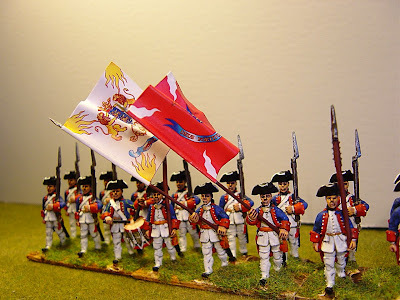 1) Perry’s 25mm French Napoleonic (plastic) battalion. 42 figures painted and based (six companies of 6 plus the light company duplicated in open order) Based as per the Perry’s supplied bases. Normally I sell 25mm figures at £5 a figure but as these are plastics I’m offering them at £3.50 per figure or £147 the unit plus p/p. 2) One Box of new Perry’s 25mm plastic French Infantry – unopened and unpainted. £12.50 plus p/p. Or free if you commission me to paint as a duplicate of Lot 1 at the commission price of £147 plus p/p. 5) Eureka 25mm WAS/SYW Dutch Generals – both mounted, one painted, one unpainted.. Plus I have some unpainted figures – 7 musketeers, 2 standard bearers, one drummer and two officers. Make me an offer or I will throw these all in free for any individual who buys Lots 3 and 4 together.